Alice is the youngest member of our current show team but this has not hampered her in the least. 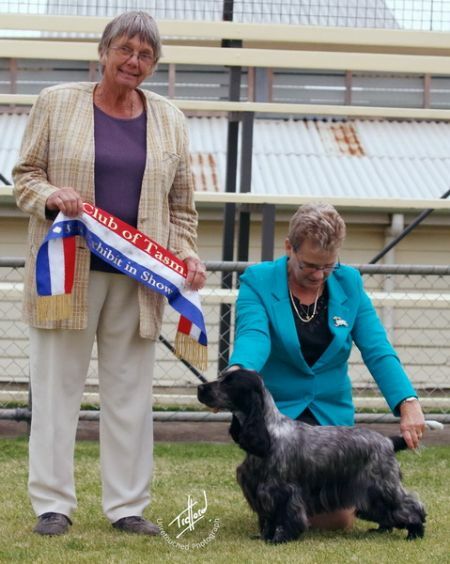 Not only is Alice a multi class in show winner she finished her title the way dreams are made with BEST EXHIBIT IN SHOW from the Puppy Class at the Hound Club of Tasmania PM show 29th March 2014 under group specialist Margaret Giles. Alice has a lovely Cockery body and exuberant attitude, we are ever grateful to Ann O'Keefe for allowing us to use Tully. Alice is DNA tested clear of PRA and FN.